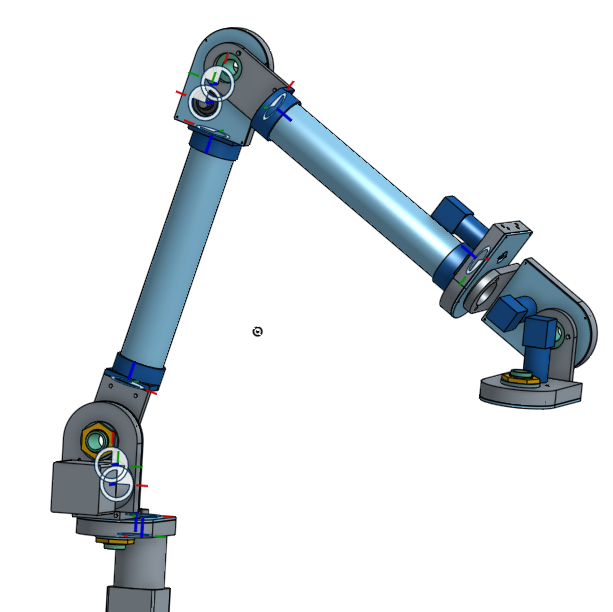 The flagship project we’re working on here at Seaport R&D is our 6-degrees-of-freedom robot arm. This page gives a brief overview of the goals and design. There’s also a hackaday.io project for it if you’d like to read and follow over there. An open-source, 6-degrees-of-freedom arm with at least 24″ (~600mm) reach and 1lb (~1/2kg) payload with a basic 2-jaw gripper, that can be built at minimum possible cost and design for maximum end-user hackability. As of May 2015, the mechanical design is nearing completion and the payload-bearing capability has been validated. The electronic and software components are still being revved aggressively but are making steady progress. In short, it’s alive! The world of the future has always been depicted as being filled with robots, and I want to make that future highly hackable. While the use of robots in industry has grown steadily for decades, they’re still largely extremely-expensive capital investments used for automation of mass production. Outside of factories and labs, there’s the Roomba and not much else. That’s about to change. Mechanically, robots are nothing new: the limiting factor is software. With CPU cycles continuing to get cheaper, complex tasks like high-speed computer vision are starting to become “affordable” in computing terms for consumers. While it’s fun to build software that can recognize things in the physical world, the real excitement begins when that software can interact physically with that world. I want to build a platform that makes doing that a lot easier and more widely-accessible. The goal of this project is to make available a reference design that can be easily replicated and modified for use without the end-user needing to reinvent the whole stack from scratch. Genesis, or, what made you do this? This project began when I needed a robot arm for a project and didn’t want to spend $35,000 for a new arm or rely on surplus ‘bots full of extremely proprietary, expensive, and difficult-to-replace parts. Since the basic mechatronics of robots aren’t that complicated, I figured there must be some open-source designs or builds out there I could start with. What I found was that besides the commercial options, there were a lot of toys, some of which are impressive but very limited in terms of payload and reach, and some educational robots which cost $5k+ for still-limited capabilities and came with lots of proprietary baggage. There were a few independent projects out there to build an arm like I wanted, but they weren’t designed to be replicated easily or cheaply. 6DOF: The arm is based loosely on the PUMA model which was the basis for many of the early industrial arms. Six degrees of freedom gives it the capability to reach into a space in a way similar to a human arm. Commodity Parts: The bearing stack for a joint costs less than $5 in quantity of one. Gears, motors, and electronics similarly try to maximize the use of low-cost, off-the-shelf parts as much as possible. Modular: Joints are designed to be building blocks that can be used individually or grouped together. While the design is for a PUMA arm, it could very easily be used to build a SCARA pick-and-place machine, or anything else that’s based on a series of programmable rotating joints. Manufacturable: If the parts can’t be bought off the shelf, they’re designed to be as easy and cost-effective to manufacture as possible. There are a minimum number of custom parts, and they’re reused so that a complete arm uses six of the same joint gearbox housings rather than a unique housing for each of six joints. Parts are designed for the fewest and simplest setups possible. The goal for this project is to provide a living reference design that anyone can pick up, make, modify, and use without limitation. When the initial version is complete, all necessary source code, bills of material and supplier lists, and solid models or drawings will be published and made available under an appropriate open-source license. I came across your site a few days ago when searching for LinuxCNC + inverse kinematics…..or something. Anyway, I completely agree with your assessment of the situation re: robot options. As you point out, on the (extreme) low end the only diy projects out there I see are pretty much toys. I find it sort of odd, b/c there is an extremely active community in the hobby CNC world (e.g. CNCZone) and many of those people possess all the skills needed to make robots of the same quality you see on the different diy CNC communities. I know for me, all it took was a little research into inverse kinematics to realize the main thing separating Cartesian machines from traditional robot arms is really just one more step to solve the trig (talking purely ptp level movement here). My CNC uses KFlop, which is capable of driving 6 axes. And iirc LinuxCNC will do even more than that. While there is the sticky issue of gearing once you get into servos and higher payload arms; I believe a stepper driven relatively low payload/reasonable reach arm is completely doable. And to your larger point, I too think we will see a proliferation on the lower end of robotics, and automation in general for that matter, in the coming years. I think the days of large industrial vendors being the only game in town are coming to a close; I believe we will see more low cost, less capable (at least in the beginning) options become available all across the automation spectrum. Well, I am rambling. Just wanted to comment and let you know I appreciate you taking the time to post and let you know I am looking forward to following your progress. Gabe, thanks for the vote! I’ve been doing a good deal of work in the shop lately and hope I will have the full assembly moving in the next month. My name is Gabriel and I want to start a robot arm project for my final graduation work. I am looking for things that can help me on that. Can you, please, send my some information about the motors or anything that you have learned?